You are here: Home / Handling Money on the Road / Paying for Things While Traveling: Credit, Debit, Cash or…? 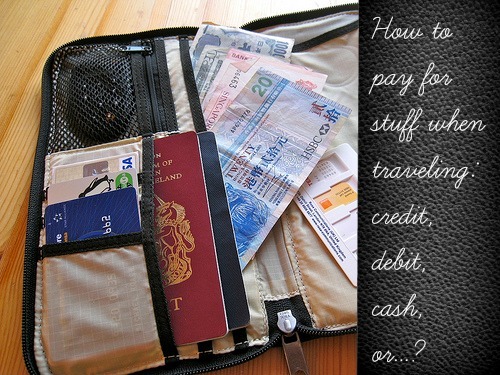 Paying for Things While Traveling: Credit, Debit, Cash or…? There was a time when you always had to get some travelers checks before going abroad. Now, with so many choices when it comes to payment methods, how is a traveler supposed to decide which one to go for? Making the wrong choice could easily cost you hundreds of dollars in fees, not to mention the frustration of not being able to buy anything. The correct answer is to prepare yourself with several payment methods. Card swipe machines and ATMs can be picky and temperamental. Even if they supposedly accept Visa, they could be in the mood to spit out your card instead. At the minimum, you should have two credit cards (for most purchases), two debit cards (for cash withdrawals) and some cash (only when necessary). There are also other payment methods that you can use as a safety net. 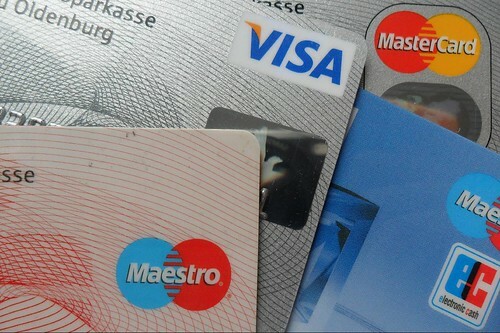 Credit cards should be your default payment option, especially for big transactions. 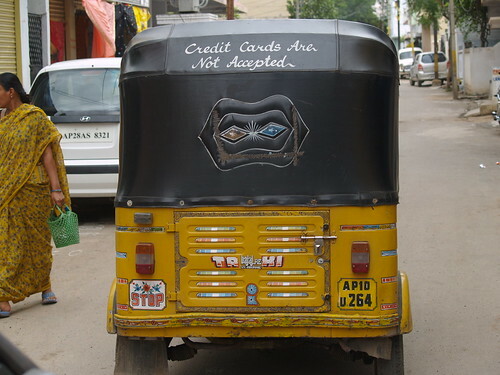 Credit cards offer great exchange rates and fraud protection features. You’re also often protected against such travel staples as baggage loss and flight delays. And let’s not forget those frequent flyer miles and reward points. If you’re interested in travel hacking, you can start by reading this guest post that explains how to start in four simple steps. Credit cards may come with high fees, but you could avoid or at least minimize these fees by choosing travel-friendly credit cards that doesn’t charge any currency conversion fees. Also, always choose to charge the card in local currency. Some merchants would insist that you pay in your home currency “for your convenience”, but, really, they’ll just charge you exorbitant fees for this “service”. Known as Dynamic Currency Conversion (DCC), this can add a premium of 3% to 7% to all your purchases. Read this blog post for more details on DCC fees. 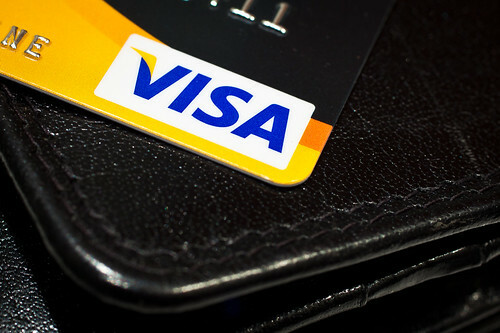 If you can’t pay with your credit card: Go with your debit card or cash. But don’t carry loads of cash from home; that wouldn’t be very safe. Instead, use your debit card to withdraw cash from ATMs from time to time. To minimize withdrawal fees, get a debit card from an international bank like HSBC or from a member bank of the Global ATM Alliance. 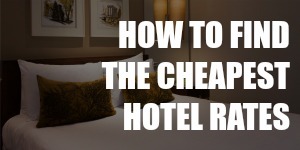 If you can’t withdraw cash with your debit card: Be nice to your hotel receptionist or retail cashier and ask him if he’d do you a big favor by charging your debit card and giving you cash. It’s normal for cashiers in Australian supermarkets and convenience stores to ask if you’d like to “cash out”, but this might be less common elsewhere. There’s no cheap option if you can’t do this, so you should wait if you can. If it’s urgent, use your credit card to withdraw some cash — your bank will start charging you interest immediately, so steel yourself when you get your credit card statement. If you have some other currency, hit up an exchange bureau. If you can, check out a few bureaus before choosing one because the rates may differ. You’ll still get a crappy exchange rate, but you know what they say about desperate times. If you can’t use your credit and debit cards and you’ve run out of local currency, there are several possible back-up options, all of which will cost you. As the name suggests, you have to load a prepaid travel card with money before using it. This card masquerades around looking and behaving like a credit or debit card, but it’s all a lie. 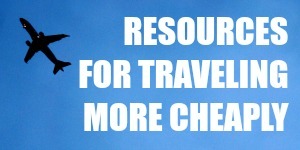 Why use it at all: Many places accept prepaid travel cards and the exchange rates are not bad. There are safety features to protect you if you lose the card. Why use it only in emergencies: Fees — all sorts of them. There’s an activation fee when you get the card; there’s a foreign currency transaction fee every time you use the card (as much as 7 percent of each transaction); there’s a service fee when you reload more money into the card; there’s an ATM fee when you withdraw cash; even if you don’t use it, you could be charged an inactivity fee. Travelers checks are so 70s — nobody seems to use them much these days. But they still have their uses. Here’s how they work: you load travelers checks with money at your home bank and cash them at another bank when you’re abroad. Why use them at all: You have to provide proof of identity when you cash them, which makes them quite safe. And if you travel to rural areas, you may only be able to find banks and no working ATMs, at which point you’d be glad you have travelers checks. In some places, you could even get great exchange rates with them. Why use them only in emergencies: You may have to pay fees when you get them and also when you cash them. They’re inconvenient because you have to physically visit a bank branch and actually line up to speak to the teller — seriously, who does this anymore? Unless you’re an expat or a resident abroad, you probably don’t have a local bank account. But you could still have some money sent to yourself via postal money orders and companies like Western Union. The money could come from your own bank account, credit card or debit card. Failing all those options, it could also come from a generous friend or family member. 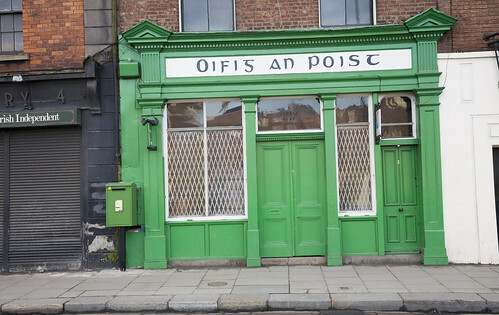 The post office — not just for sending postcards. 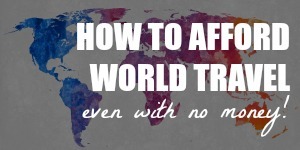 Why use it at all: Money transfer companies and post offices are available all over the world. You could get the money within minutes if you’re willing to pay higher fees. Why use it only in emergencies: You have to personally visit a money transfer company, post office or bank branch to get the cash. There could be long wait times and, depending on the particular service you use, you could find yourself paying steep fees. The exchange rates also aren’t all that great. Photos: 1. mroach (CC-BY-SA 2.0 License); 2. Thomas Kohler (CC-BY-SA 2.0 License); 3. Sumanth Garakarajula (CC-BY 2.0 License); 4. Jason Rogers (CC-BY 2.0 License); 5. Håkan Dahlström (CC-BY 2.0 License); 6. William Murphy (CC-BY-SA 2.0 License). Great advice! I also recommend keeping your cash and all your cards in different spots, that way if you loose something or let’s say your wallet gets stolen you haven’t lost all everything. Nice tip! It’s always a good idea to prepare for emergencies. Debit cards in NZ usually refer to debit credit cards (they are eftpos cards with a Visa/MC logo and are used like credit cards). This has at times caused me confusion elsewhere as I’m not quite sure how others categorise my debit MC! Now that I’m in North America I can thankfully use my cards almost everywhere and save on ATM fees, unlike cash-heavy Europe and Asia. Oh that’s right, I remember my Visa debit card in Australia. Every time I make a payment, they’d ask whether I want to pay by debit or credit. Shouldn’t you be able to use it wherever they accept MasterCard? I thought that was the whole idea of making those cards. I highly recommend taking at least 2 credit cards and 2 debit ones (different banks). That’s because the security strips on these become so easily corrupted, etc. Also, keep your focus on security. NEVER use an ATM machine at anywhere other than a bank or airport. If a hacker drains your account you may be out of luck. Moreover, take one credit card with a low limit that you use for everyday transactions and a high-limit one for emergencies. That tones down the risk. Do not carry both on you at the same time. Keep copies of all these (front and back) plus your passport in the cloud, where they can be accessed in case of loss. Thanks, Don! You’ve got some great tips there. It’s definitely safer to take 2 credit cards and 2 debit cards. Sometimes the reader machine could refuse one card for no reason and accept the other one. I’ll update the post!